Carve up some screams this Halloween with this budget-friendly safe kiddie size Fake Bloody Chainsaw! Toy horror movie theme prop weapon measures approx. 18-inch Long x 6-inch Wide. Features soft molded plastic silver gray body and blackened bar saw-chain smeared with white color paint splashes and faux red blood spatter. 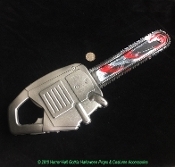 Decorate your slaughterhouse, chop shop or meat market, CREATE HAUNTED HOUSE WARNING SIGNS, creepy horror photo booth prop, or accentuate your serial killer costume with this murder themed chainsaw accessory. Cheap, small lightweight prop building accessory, HOLLOW BLOW MOLDED SOFT PLASTIC. Static Prop does NOT make sounds. *Warning: Not for Children Under 3 years old. Handle approx. 1-1/8-inch (2.81cm) Thick. Blade approx. 0.25-inch (0.63cm) Thick.